A seasoned Templing in Reykjavik, Árni has been working at Tempo for six years. He has a bachelor’s degree in Software Engineering from the University of Iceland and a master’s degree in Computer Science from Oxford University. 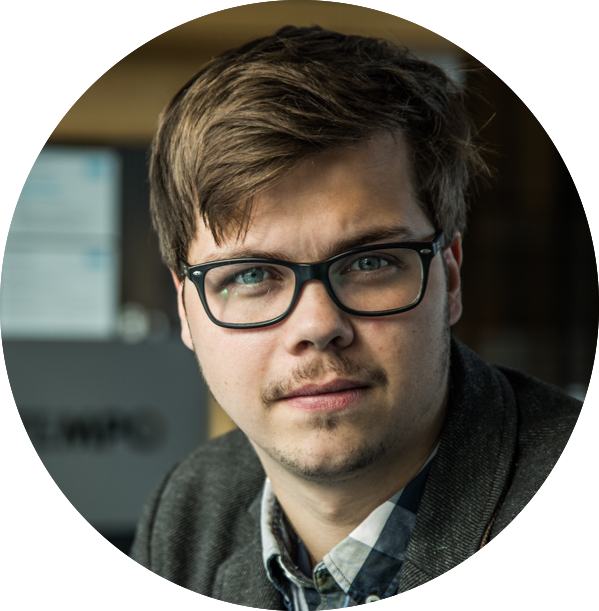 We interviewed Árni, who is now a Team Lead in Software Development, about his experience at Tempo. Tell us a bit about yourself and why you started working at Tempo. When I was studying software engineering at the University of Iceland I started looking for a summer job. There was a small division at an intermediate size software company that was hiring and I applied and that’s how I started working at Tempo as a summer intern. I’ve been here ever since. What does your typical day at Tempo look like? I start my day by grabbing a coffee and looking at code reviews from the rest of the team members. When everyone on the team has arrived, we have a daily stand-up and plan out the work for the day. Then I almost always do pair programming with someone on my team. Software development is a group effort and at Tempo we really emphasize working together to develop our software. Because I’m team lead I have meetings with different people. We collaborate a lot with the designers and the product team at Tempo when we’re implementing our features. So we do design reviews to see how we can implement this or that in our code. Basically my days are like this: I focus on helping the rest of the team to achieve their goals. What is the company culture like at Tempo? The company culture has changed a lot. When I joined the company, we were just a big family — there were only seven of us working on Tempo and it was still just a department within another company (TM Software). We were really young; most of the people we hired had just graduated from university. Now it’s become a bit more mature, but it’s still really friendly and we have fun at work. We aim to write quality code and do quality work each day. We also have a flat company structure here at Tempo, so everyone can have an impact. Interns and newcomers can all have an impact on the product we are developing. Can you tell us about your team and your role at Tempo? We are a team of six. I’m a developer and the team lead and we have four other developers and a Quality Assurance Engineer. We are the only development team that has the same amount of guys and girls, which is not so common in the software development industry. What was your part in developing Tempo as a product? When I started as a summer intern, I was responsible for developing all of the gadgets for Tempo, which are these small reports that people can set up on their Jira dashboards. From there I was part of the team that created Planner and maintained it for the first three years. Since then I’ve transitioned more towards writing front-end code and I’ve been mostly working on user interface features and doing the front-end for Tempo across most of our products. I was also on the team that did the total rewrite of Timesheets for the Cloud. Now I’m back at Planner so I’ve gone full circle. What tools and frameworks do you use at Tempo? We use many. Because I mainly write front-end code at the moment, we are heavily invested in React and Redux and we’re also looking at doing some mobile development in React Native. Of course we use Slack and BitBucket and our cloud infrastructure is running on Amazon Web Services. Is Tempo an agile company? We definitely are. We estimate the time needed to complete epics created by the product team and try to deliver them on scheduled time. We work in sprints and we have retros, daily stand-ups and sprint reviews… we have it all. We try to skip having meetings when there is no need for it, because that’s just not agile at all. My favourite part of the job is when I get into the zone. I love when I pair program with someone and everything just clicks and we manage to finish something that was seemingly days worth of effort in just the span of an hour. Also, because I’m a front-end engineer, I really love it when these ambitious designs that our designers have given us come to life. What advice would you give to others seeking work in your field? I think it’s important to have fun at work and really enjoy writing the code. I think it’s also important to be social. Because everyone works in the same codebase and you’re all going to touch on each other’s code, it’s important to be helpful with people who are working close to you. In terms of education, I think it’s always good to have a university degree, but it’s not as necessary as before because there is so much content online for aspiring programmers. Try to improve yourself, it’s a full-time job to stay up-to-date, but we try. It’s really important to always learn something new so it will always be refreshing to be at work.